If you want to see supply and demand in action, look no further than cruise parking in Galveston. With all of the options, it can be a little overwhelming to figure out which lot you should park at. Most lots are similar and located about the same distance from the port. The major differences between most lots is whether or not they offer indoor parking and if they have any special deals. For all lots it’s a good idea to reserve and pay online ahead of time. Not only does this guarantee you a parking spot, but online reservations usually have a $5 discount off the “drive-up” price. We also have a listing of coupons (up to $15 off!) here. Note that there are quite a few caveats with the table listed above. First, the rates listed reflect any discounts available for booking online ahead of time. Second, all rates are listed for the cheapest available parking, which is outdoor, except for Galveston VIP Indoor Parking, which offers only indoor parking. 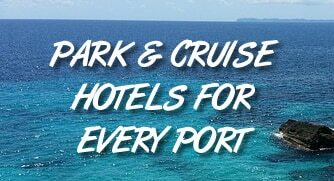 If you’re looking for the best combination of location and price, then Cruise Park Galveston is the answer. This small lot is one of the closest to the port, but it is also the cheapest — just $59 rate for a 7-night cruise. The lot is lighted and fenced. It is also easy to find (you can’t miss the big “Cruise Park” sign on Harborside Drive). This lot won’t work for many passengers, however. It only offers parking for Sunday to Sunday 7-day cruises. If your cruise isn’t within this schedule, then you’ll have to find another lot. There is also no shuttle to the port. Among the cheapest places to park, DCP Cruise Parking charges as little as $9 per day if prepaid, but rates vary depending on the cruise and time of year. The lot is fenced and gated, however it is some distance from the terminal. The company does offer shuttle service for you and your luggage. Due to the lower prepaid rate and relatively small lot, we suggest booking in advance. One of the newer lots in town, Falstaff offers indoor parking at rates that are even cheaper than most outdoor lots. Part of that low price is that the lot is a little farther than most lots from the port, but still a quick shuttle ride to the port. Don’t let the name fool you… 81st Dolphin Parking is actually much closer to the port than the name leads you to believe (and nowhere near 81st Street). You’ll find it at the corner of 28th Street and Avenue D — about 6-7 blocks from the cruise terminal. The lot is fenced and features night security as well. And don’t worry about walking. Dolphin Parking offers a shuttle to the port. There is also space for oversize vehicles. Lighthouse Parking is located right next to the Port of Galveston’s “official” lots, yet offers a rate that’s less than the official port lots. Lighthouse offers covered parking for $80 (7-day trip) or uncovered parking for $70. Reservations are suggested as this lot usually sells out. Your rate includes a shuttle to and from the port, located 5-7 blocks away. Also, if you are worried about storms while you are away, know that Lighthouse Parking offers an elevated lot. Oversize vehicles are also welcomed. It doesn’t get any closer to the port than with this parking lot. It is the closet lot to the port, located just across Harborside Drive. The entire lot is fenced and lit. Most parking is outdoors, but there is also indoor parking for an additional fee. Because the lot if relatively tight, no RVs or oversize vehicles can park here. Given the proximity to the port, the $75 prepaid fee for a 7-day cruise is one of the best deals in town. EZ Cruise Parking offers elevated lots with high fencing and lighting to keep your car safe. While it doesn’t offer covered parking, the company does rent car covers if you are worried about the sun or salt air. Oversize vehicles aren’t allowed. While the lot is within walking distance of the cruise terminal, it does offer shuttle service. There is a discount for walking to the port instead of taking the shuttle. Reservations are recommended as the lot often sells out. The port offers “official” parking, and guarantees a space for all cruise passengers. The lots themselves are located on either side of Harborside Drive, between 29th Street and 33rd Street. The lots are fenced and lit. Parking for oversize vehicles is available for an extra charge. Situated close to the official Port of Galveston parking, this facility offers both indoor and outdoor parking in its 24-hour secured lots. Rates are in line with other lots close to the port. A 7-day cruise will cost you $90 if you choose the indoor option and $75 outside the building. A free shuttle to the port is provided back and forth from your car. All spots are indoor parking. Keep in mind that because of the building, they can’t offer parking for oversize vehicles. Given the prime location and small size of the lot, it’s a good idea to reserve your spot ahead of time as it will fill up. Also, prepaid parking rates save you $5 off the drive-up price. As you can see, most lots are right near the port. The lone exception is Discount Cruise Parking. However, it offers a shuttle right to the port. Which parking is best or the highest-reviewed? Many people ask if there is a particular lot they should use. Truth is that these companies put a lot of effort into giving you a good experience at a fair price, or else they wouldn’t be in business. We have personally parked at both EZ Cruise Parking and Galveston Park N Cruise. Both lots were great for us. While Galveston cruise parking is cheap, it’s not free. If you are a disabled veteran or have a Purple Heart, the official Port of Galveston lots will give you free parking as long as you 1) have a state vehicle receipt with that designation 2) have an ID that matches the registration and 3) have a vehicle with disabled veteran or Purple Heart recipient license plates. Are there cruise parking coupons or promo codes? Yes, with so much competition, there are a number of lots that have coupons that give you further discounts. We’ve covered them in detail on this page. As well, be sure to book your parking online ahead of time. It provides $5 off the drive-up rate for most parking lots. You don’t have to reserve ahead of time. Just show up and let the attendant know. They will direct you on how to park for free.